What are Sigfox Ready Wireless Transmitters by OleumTech? The OleumTech® Sigfox Ready Wireless Sensor Nodes are designed for deployment anywhere in the world that Sigfox has network coverage. By leveraging the Sigfox Low Power Wide Area (LPWA) network, you can take advantage of the world’s leading Internet of Things (IoT) connectivity service, offering a software-based communications solution where all the network and computing complexity is managed in the Sigfox CLOUD. The OleumTech Sigfox Ready Wireless Nodes take advantage of the built-in firewall, since it is not directly connected to the internet and does not use Internet Protocol. Layered on top of this secure foundation, OleumTech provisions each device with a unique symmetrical authentication key. Each message sent by our nodes contain a cryptographic token that is computed based on this authentication key and verified by each Sigfox Base Station. Sigfox launched in France in 2010 and is recognized as a pioneer in building out a global, simple, low-cost and low-power connectivity solution. The goal is for the network to listen to billions of objects without the need to extablish and maintain network connections, accomplishing this with a compact optimized protocol. At present, Sigfox has over 10 million endpoints connected worldwide. Why Did OleumTech Partner with Sigfox? Sigfox is building out a global Low Power Wide Area (LPWA) IoT Network and OleumTech’s Intellectual Property (IP) related to self-contained, battery-powered transmitter technology is a natural fit to Sigfox which is very much complimentary to OleumTech’s traditional platform offering. For many industrial customers, stranded assets are just part of the cost of doing business. In a recent interview, a CEO of one of the world’s largest oil companies estimated that over 70% of the company’s assets were isolated. Another large energy company estimated that over 100,000 endpoints were isolated worldwide. The nature of these assets and locations do not warrant building out a network. Thus, these companies send individuals to manually collect this data; in one case, every five weeks. This is a perfect fit for OleumTech.  The Sigfox architecture is based on multiple Base Stations receiving each broadcasted and repeated message building redundancy into the solution. The goal is to have a minimum of three Base Stations hear every message. Since it is a simplex (one-way) system, no acknowledgments are received. Therefore, each message is broadcasted three times on each of three different frequencies providing a very reliable architecture. In fact, Sigfox is willing to offer a Service Level Agreement (SLAs) to guarantee its performance. Once the message is received at the Base Station and authenticated, the information is forwarded to the Sifgox Cloud where message sequence numbers and timestamps are checked. All redundant messages are then de-duplicated. Customers then have the ability to access the data through a variety of methods. Where Does Sigfox Have Coverage? What is the Range of Sigfox Ready Transmitter? The estimated wireless range is 12-19 miles (20-30 km). Sigfox plans on a fade margin of 20 dB. What is the Capacity of a Sigfox Base Station? Each Base Station can support at least 1 million endpoints.